This aster provides a striking mix of colors: white, pink, purple and shades in between. Start indoors and transplant when they're about 3" tall. Attracts butterflies. Aster, Fireworks Mixed Colors is rated 5.0 out of 5 by 4. Rated 5 out of 5 by NebraskaMan from Oh good heavens yes. Plant these! Long stems, very colorful, easy to grow, outstanding vase life and variety. Rated 5 out of 5 by JustJo from Fireworks! I was shopping for other things in the Burpee store and bought these seeds as an afterthought. Planted them in my flower box and pretty much forgot about them until they bloomed. Wow! Lots of perky flowers on straight stems. Very healthy and resilient. Glad I spotted them. 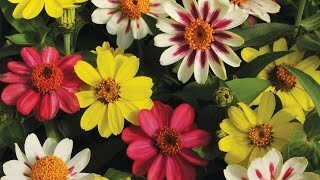 Rated 5 out of 5 by Quilmomma from Wow, great cut flower Love this Aster!! Easy from seed to garden, tons of flowers & enjoyed them all summer. Rated 5 out of 5 by datw44 from Fireworks Aster Mix I planted these seeds in pots for my patio. I didn't know what to expect because this was the first time I tried this variety. All I can say is WOW!!! They are the prettiest flowers!! They really do look like fireworks. Everyone oohs and ahs when they see them. They love my sunny, hot patio, and as long as they get plenty of water they stay happy. HIGHLY RECOMMENDED!